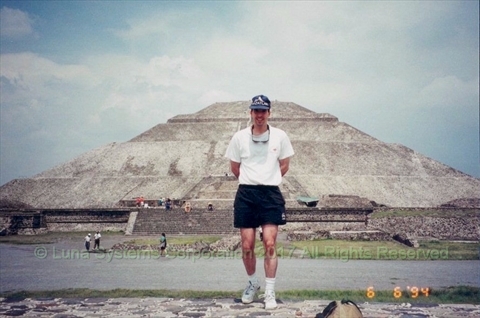 The inspiration for the name 'Luna System Corporation' came from a trip I took to Mexico to attend a wedding. The wedding took place in Tulancingo, Hildalgo, Mexico which is about 2 hours by car north of Mexico City. Myself and the others in the wedding party flew into Mexico City first, then travelled north to Tulancingo for the wedding. I really enjoy visiting archaeological sites so I convinced the wedding party to stop at Teotihuacan, a large archaeological site, for a visit on the return to Mexico City! 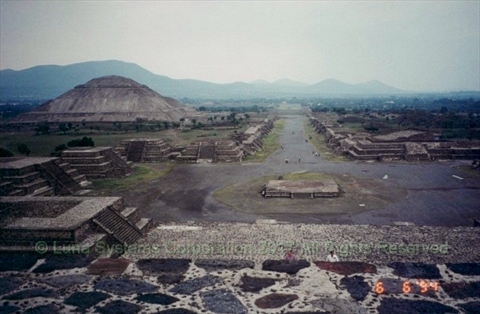 Teotihuacan is located about half way between Tulancingo and Mexico City. Teotihuacan was a city of about 100,000 people inhabited around 100 BC to 250 AD. 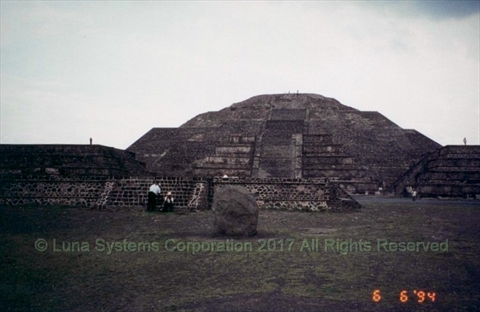 Teotihuacan has 2 large pyramids: Sol and Luna. In Spanish 'Sol' means 'Sun' and 'Luna' means 'Moon'. This is what happened after we arrived. It was a beautiful sunny day when we arrived at the site. The pyramid Sol was in front of us and was huge. We decided to climb the pyramid and have lunch at the top of it. The pyramid has a large staircase built into it so it was a big 'stair climb'! The view from the top of the pyramid Sol was amazing! We could see for many miles in all directions. 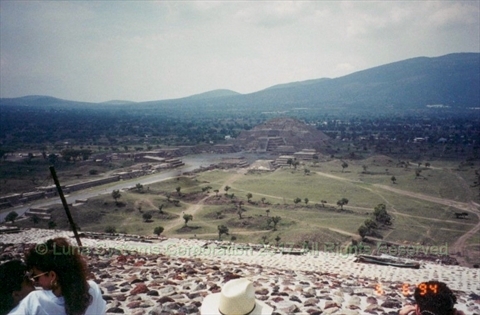 This view also gave us a bird's-eye view of the Pyramid Luna. There is a long road running from the front of the Pyramid Sol directly into the Pyramid Luna. This road is called the 'Avenida de los Muertos', which translates to the 'Avenue of the Dead'! You will notice that the Luna Systems Corporation logo has a long line coming out of the pyramid. This line represents the 'Avenue of the Dead'! After descending from Pyramid Sol we decided to walk the Avenida de los Muertos and go climb the Pyramid Luna. As we walked towards Luna the clouds slowly started building. It was actually quite a long distance. We finally reached the pyramid Luna and climbed up it. Upon reaching the top of the Pyramid Luna, the clouds in the sky were really thick! We started to hear thunder! Then the lightning started! Here we were standing on top of a pyramid in the midst of lightning! Needless to say we snapped a few photos then immediately descended the pyramid for the slightly more safe Avenida de las Muertos! In the end we did survive and we have this great story to tell! After all this transpired we went for 'barbacoa', i.e. barbequed food, at a restaurant across from the archaeological site for a good meal! In 1996, after spending 9 years with Andersen Consulting, I decided to go out on my own as an independent computer consultant in Vancouver. I decided to name my company "Luna" so I could tell this amazing story! Since 1996, I have been providing independent computer consulting services to businesses in the Vancouver (Lower Mainland), British Columbia, Canada area!